As I woke to the news that Chik-fil-A founder S. Truett Cathy passed away today, I couldn’t help but think of a good friend of OneHope who recently passed as well, Reverend Belvy C. White. His generosity in giving to OneHope was as faithful in death as he was in life, leaving a financial gift as his legacy to the ministry. Over the years, he and the churches he pastored faithfully supported the ministry of OneHope both with their prayers and with their finances. Belvy even volunteered as a ministry representative for a season, spreading the word about OneHope and casting vision for our work. In his lifetime he helped reach countless children with God’s Word, not to mention the number of others he inspired to give and reach with God’s Word. It got me thinking about the story of the widow’s mite. So many of our givers aren’t blessed with overwhelming sources of income, but they ARE faithful. They are passionate about the ministry and love praying for the children of the world. They support us as we work through local churches to maximize every effort to get God’s Word into the hands of children and youth around the world. They love being a part of our mission, love to serve and have the gift of giving to the mission of God—they’re just oozing with OneHope DNA. Jack has been a partner since 2003, but really became sold out after a distribution trip to El Salvador in 2007 that changed his life and perspective. He married Shirley in 2008, and they traveled with Bob to Southern Mexico in 2010. Shirley says this trip changed her life, and now they both love to tell everyone they can about OneHope. Steve and Wendy are living out their incredible dream of serving God through boating—hear their miraculous story and how they are investing their talents into His Kingdom Set Sail! from OneHope on Vimeo. Chuck helped raise money for our first distribution in El Salvador in 1987. He and his wife Inez have remained faithful supporters and have inspired several friends to join in partnership with OneHope as well. Reverend Bolton Bangs said, “as long as I’m alive and breathing, I’ll work for the Lord.” Listen to his incredible “career choice” post-retirement solely to support the work or OneHope. 26 years of faithfulness and reaching 400,000 kids should be front-page news! He was truly laying up treasure in heaven… In Memory of Bolton Bangs from OneHope on Vimeo. Charles and Mary have been faithful supporters since 1999. They even have their church’s seniors group, called “The Golden Agers,” supporting OneHope now and love speaking to other seniors groups in their area about OneHope. Ric pastors a church, and when he first had me out to speak, the Holy Spirit spoke clearly to Ric and told him to help OneHope do the work God has called us to. Since then, he and his wife Christy and their church have been faithful partners who have taken 37 teams to the field to do OneHope work! This list of partners with the OneHope DNA coursing through their veins could go on and on if space permitted. 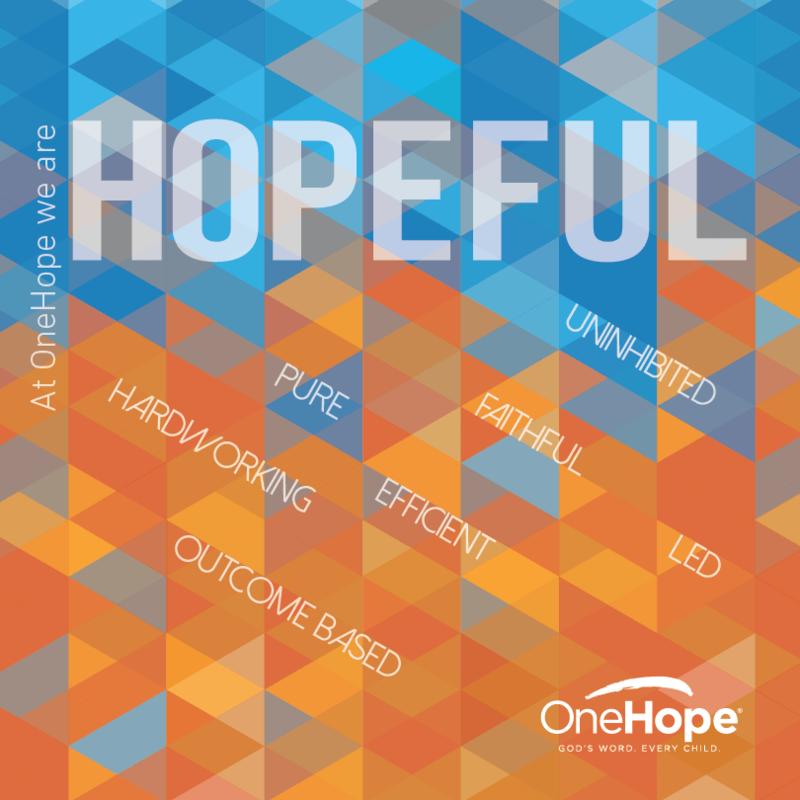 Without each and every one of them, the work of OneHope would never happen. My dad always says, “When God gives the vision, He also gives the provision.” It has never been truer than as I’ve watched Him mobilize His people to continue to provide the resources make the Great Commission through the work of OneHope inevitable instead of impossible in our lifetime. and your many loyal and faithful supporters will have many souls standing around the throne because of their heart and passion for Jesus. Thanks again.